The Crystal Serenity is a mid-sized ship with a distinct up-market feel. The Penthouse with Verandah reflects this with sophisticated decor and an enormous teak verandah. The Crystal Serenity was entirely refurbished in 2013 and now it has an air of art deco, Hollywood glamour. This mid-sized ship never feels crowded, even when fully booked with 1,070 guests. In fact the Crystal Serenity has one of the highest space to passenger ratios of any cruise ship. The Crystal Serenity has a big range of room types including rooms with and without verandah, hypoallergenic rooms, penthouses and suites. The first of the larger room categories is the Crystal Serenity Penthouse with Verandah. The Crystal Serenity Penthouse with Verandah have a sophisticated, Hollywood-glam decor. A soft palate of greys and creams are used with dark timber cabinets serving as visual highlights. The clever use of mirrors makes the space seem even brighter and just a little bit larger. The Penthouses with Verandah (category PH) are located across two decks of the Crystal Serenity. On deck 10 they can be found mid-ship, while on deck 11 they are mostly located aft, with a small number positioned mid-ship and forward. CruiseOyster note that the living space in the Crystal Serenity Penthouse with Verandah is modest in size. In this space is a very comfortable 3-seater sofa, arm chair and coffee table at the foot of a king-sized bed. Penthouse with Verandah sitting space. A leather bedhead reaches all the way to the ceiling. This is framed by inlayed panel timber on either side. Dark coloured cabinetry runs down one side of the bedroom incorporating an entertainment unit. The cabinetry gives way to a marble writing desk which divides the living and dressing space. Tasteful artwork adorns the walls. Penthouse with Verandah sleeping area. While the living space may be considered modest, by contrast the bathroom is very large. The Crystal Serenity Penthouse with Verandah bathroom boasts a full size jacuzzi bath, separate walk-in shower and a double vanity. Luxury Grohe tap wear and shower roses are used throughout. There is excellent lighting and plenty of storage space on the shelving both above and below the vanity. The Penthouse with Verandah bathrooms feature luxury Italian ETRO S.P.A. amenities (in full 150ml bottles) and Frette bathrobes. The bathroom of the Penthouse with Verandah. The spacious verandah is the best part of the Crystal Serenity Penthouse with Verandah. It runs the entire length of the room and is very deep. There is plenty of space for two comfortable outdoor armchairs with accompanying ottomans and a good-sized table. The large outdoor space of the Penthouse with Verandah. Guests staying in the Crystal Serenity Penthouse with Verandah get the services of a butler throughout their voyage. The butler will help with packing and unpacking, he will also deliver an afternoon tea service or arrange pre-dinner cocktails and canapés in your room. Crystal Serenity Penthouse with Verandah guests also get complimentary garment pressing and in-suite dining (including menus from specialty restaurants Silk Road and Prego, served by course). 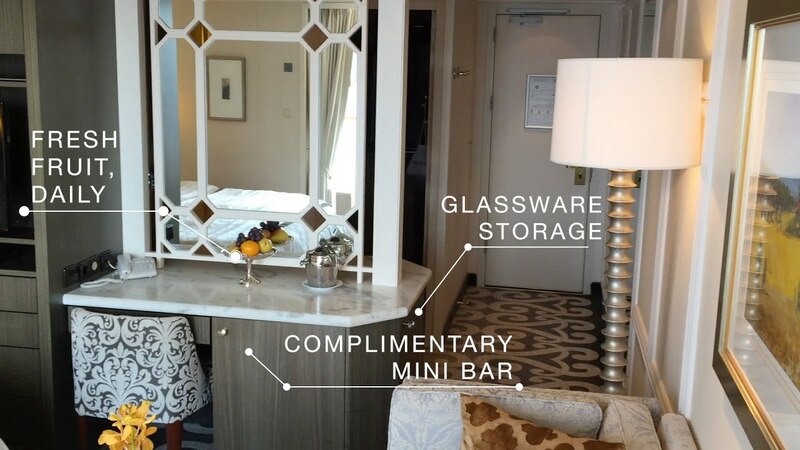 An initial minibar setup from a set menu is also offered upon embarkation. There is no denying the Crystal Serenity Penthouse with Verandah is exquisitely elegant. In fact CruiseOyster rate it as one of the most beautifully appointed staterooms afloat. However, that elegance can’t hide the lack of space in the living area. There doesn’t seem to be quite enough room for two to move comfortably about the bed and sitting area. This may lead some to question the value for the price paid. We rate it 4.0 stars. The Crystal Serenity offers 6 dining options, including the Crystal Dining Room, the Trident Grill, Tastes, the Lido Cafe and the speciality restaurants Prego and Silk Road (with its accompanying sushi bar). The Crystal Dining Room is the main and largest dining venue onboard. It offers open seating for breakfast and lunch, whilst dinner has traditional early (6:15pm) and late (8:30pm) sittings as well as by reservation seating. By reservation is assigned on a first come, first served basis. Be warned, for those with early and late sittings there is no admittance to the Crystal Dining Room earlier than your assigned dining time. Two menus are offered in the Crystal Dining Room; an innovative “Modern” menu including such dishes such slow-cooked shiraz-braised oxtail ragout, and a traditional “Classic” menu offering dishes with a distinct French flare. Guests may mix and match items from both menus. CruiseOyster rates the food presentation in the Crystal Dining Room highly, however the dishes themselves can be hit-and-miss; sometimes excellent, while on other occasions just average. (CruiseOyster experienced some overcooked dishes and some courses arrived at the table cold). We also note that the service is fast. For those who enjoy lingering over their meal this may be off putting. The Trident Grill was entirely redesigned during the 2013 refurbishment. It is located mid-ship on the port side of the Lido deck (deck 12) and offers casual lunchtime fare including hamburgers, cheeseburgers, veggie burgers, chicken burgers, hot dogs, tuna melts, wrap sandwiches and gourmet pizzas. Orders are placed at the grill counter and then brought to your table. Opposite the Trident Grill is Tastes which is open for dinner. Tastes offers a fantastically innovate menu that is unrivalled in the cruise industry. The dishes are pan-global and fuse flavours and textures in a way that will surprise even the most hardened foodie! An excellent selection of premium wines is offered as well. CruiseOyster rate Tastes as one of the most exciting dining concepts at sea. Reservations are required, however there is no additional charge. The Lido Cafe, located aft on deck 12, offers a beautifully presented, high quality buffet selection for breakfast and lunch. The space is bright and airy with floor to ceiling glass windows offering panoramic views. CruiseOyster recommend the Lido Cafe for a relaxed lunch after a morning shore excursion. Prego is Crystal Cruises iconic specialty restaurant. As the name suggests the restaurant is Italian – classical Italian – both in decor and menu. The food is simple, in the best traditions of northern Italian cuisine, allowing the quality ingredients to speak for themselves. Beef carpaccio, homemade pasta and scaloppine all feature on the seasonally changing menu. The wait-staff in Prego also put on a terrific northern Italian ‘show’ as they deliver each course. Indeed, some have been with the restaurant since it first opened! Reservations are required and a speciality restaurant dining charge is payable. Silk Road and it’s accompanying sushi bar is located across the hall from Prego. The restaurant is a partnership with famed Japanese master-chef Nobuyuki “Nobu” Matsuhisa who trained the Silk Road chefs. The result is a stunning culinary sensation with expertly prepared Japanese classics and innovative fusions of eastern and western cuisine. Signature Nobu dishes include Lobster with Truffle-Yuzu Sauce and Grilled Wagyu Beef Rib-Eye with Wasabi Pepper Sauce. Reservations are required and a speciality restaurant dining charge is also payable. 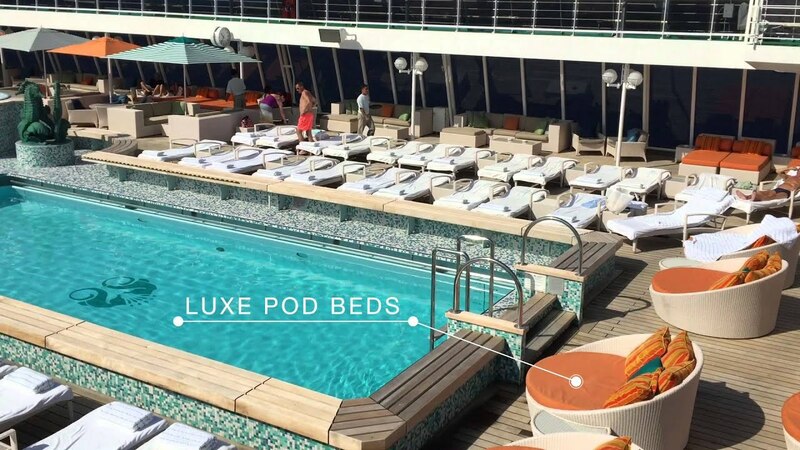 CruiseOyster rate the Lido deck with signature Seahorse Pool onboard the Crystal Serenity as one of the best afloat. The entire pool area was made-over during the 2013 refurbishment and it now sports luxury sun loungers with mattresses, stylish pod beds and plush lounge chairs and sofas. The enormous teak deck provides ample space for everyone, even on sea days. Bar service is available directly from your sun lounger or pod bed, meaning the only reason to get up is to take a dip in the refreshing Seahorse Pool!